Our service team is awaiting your call for any emergency call outs. We guarantee we will be onsite at a time to suit your needs. All of our electricians are accredited master electricians. 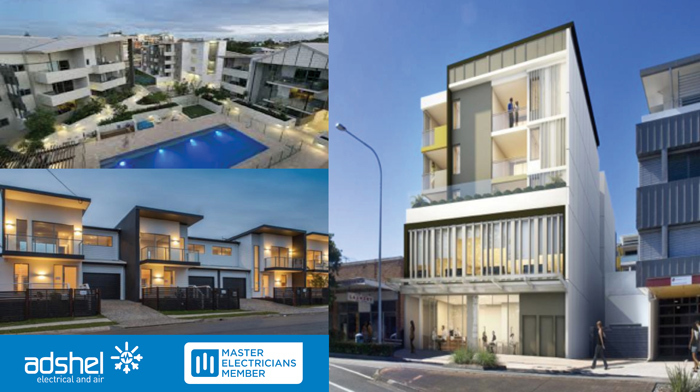 Adshel is a proud member of Master Electricians Australia..
Adshel has a 12 month Workmanship Warranty – if there is a fault with our workmanship we will return to site and fix it free of charge. We make sure you get the best product to suit your needs and budget to ensure you are getting not only safe but also up to date advice and design. Our staff use up to date procedures and methods to ensure a high standard is met assuring our clients are left feeling looked after from start to finish. Adshel holds holds safety at the forefront of the company and we ensure this to our clients by in-house staff training for procedures when working onsite and are registered Safety Connect Members.